With the end of the year approaching, schedules are getting tight, but it’s not too late to fit in one more Delta I class before next year! We’re pleased to announce a Delta I class will be held at our Denver office on 12/12 and 12/13. Our Delta Controls classes are FREE for owners and operators of a Delta Controls building automation system installed by Setpoint Systems Corporation. This is last month’s Delta III class. We had a great turnout and learned a lot! Delta I is a fun introductory class in which you can practice hands-on with a working Delta Controls system. Our state-of-the-art training facility features controllers representing the entire product line, plus examples of third-party integration and EPMS (Electrical Power Monitoring System) devices. In the Delta I class, you’ll learn basic day-to-day operation of your system including controls theory, working with I/O and setpoints, scheduling, backing up controller databases, understanding how programs work, etc. Click here to sign up today! 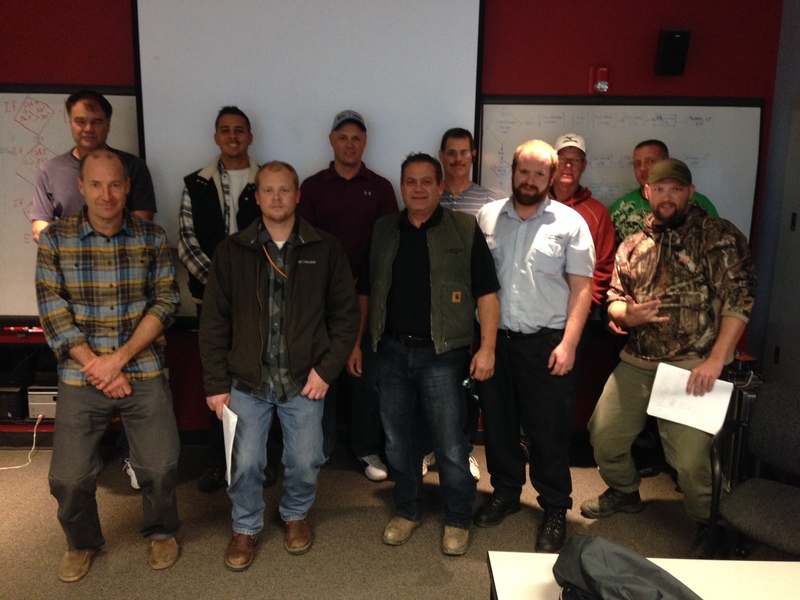 This entry was posted in Training Department and tagged Building Automation System, Delta Controls, Delta Controls Training, Delta I class, Electrical Power Monitoring Systems on November 11, 2013 by John Becker. This entry was posted in ORCAview Tips and tagged bms, Building Automation System, building energy management, Delta Controls, Orcaview, Setpoint Systems Corporation on November 8, 2013 by setpointsystems. Graphics for the enteliTOUCH touchscreen are very easy to load! Highlight one or more graphics in the Navigator, right-click, and choose “Save as HMI Page…” Graphics are transferred across the network, so you don’t have to go to each one individually. This is a huge time-saver! Was this tip helpful? We’d love to hear your feedback, leave a comment below! This entry was posted in ORCAview Tips and tagged building management systems, Delta Controls, facility management systems, Orcaview, Setpoint Systems Corporation, setpoint systmes corporation training on November 8, 2013 by setpointsystems. To set the internal clock in a controller, select the controller in the left-hand pane of the Navigator window and choose “Set Controller Time” from the Tools menu. A dialog box will appear allowing you to adjust the time and date before setting the controller’s clock. The current date and time will automatically be obtained from your workstation’s clock. This entry was posted in Coppertree Analytics, ORCAview Tips and tagged Clock, DATE (command), Delta Controls, Dialog box, orcatips, Orcaview, Setpoint Systems Corporation on November 8, 2013 by setpointsystems. One of the ways a building automation system can save you energy is by using cool outside air at certain times of the year instead of mechanical cooling. This is called economizing or free cooling. There are two types of economizers, dry bulb and enthalpy (a.k.a. wet bulb). This is where psychrometrics come into play. A typical dry bulb economizer would bring in outside air below a certain dry bulb temperature. But this doesn’t account for the total heat energy contained in the air. By measuring only the dry bulb temperature, the heat energy resulting from the presence of water vapor is ignored. This can make a significant difference. For example, you might inadvertently bring in cool but very humid outside air, causing your building to feel muggy and uncomfortable. Or you could miss out on using some very dry outside air that’s a little warmer but could help remove heat and moisture from your building. 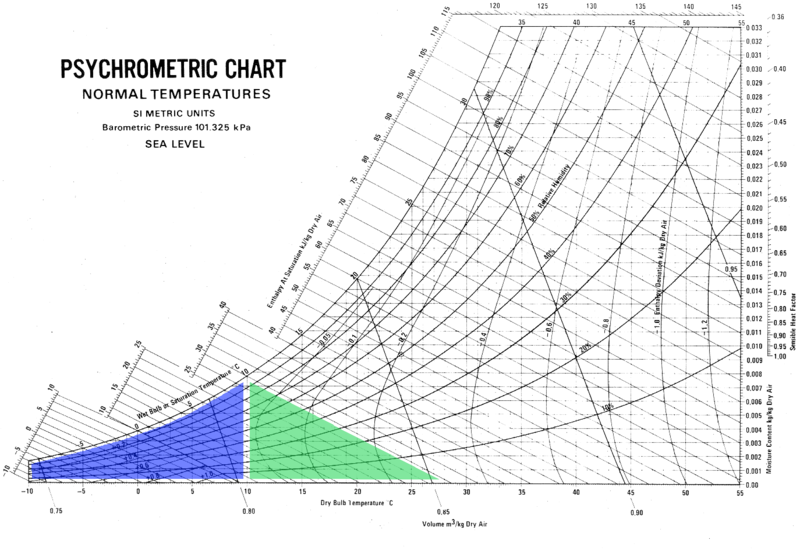 This psychrometric chart illustrates the benefit of using an enthalpy economizer. If you look at the chart on the left, you can see the difference. The area shaded blue represents conditions that a dry bulb economizer would consider adequate for cooling. The area shaded green represents the ADDED conditions that an enthalpy economizer would consider adequate. In this example it doubles the available conditions for economizing. This can result in higher energy savings than with a dry bulb economizer. Implementing an enthalpy economizer requires measurement of outdoor relative humidity in addition to temperature. The GCL+ program below illustrates how to calculate Enthalpy, Dew Point, and Wet Bulb Temperature given Dry Bulb Temperature and Relative Humidity (all temperatures in °F). This GCL+ program calculates various psychrometric properties of air. // Calculates psychrometric properties based on Dry Bulb Temp (deg. F) and Relative Humidity. This is just one example of what you can learn by attending our free Delta Controls training classes. We’ll be adding new session soon, so stay tuned! This entry was posted in Industry Educational Resources, Training Department and tagged Delta Controls, Denver, economizer, energy savings, Enthalpy, GCL+ programming tips, HVAC, Psychrometrics on October 26, 2013 by John Becker. 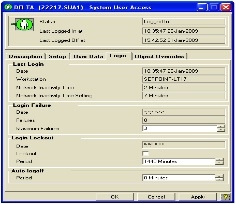 The Auto-logoff period is the amount of time that ORCAview will sit idle before automatically logging off of the network. 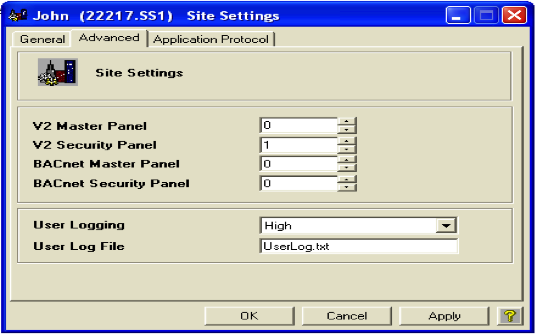 You can disable this feature by setting the period to 0 on the “Login” tab of your System User Access (SUA) Object. Click on the “Login” tab, and you’ll see something like the picture on the right. The Auto-logoff period can be changed at the bottom. This entry was posted in ORCAview Tips and tagged BAS, Building Automation Controls, Building Automation Systems, Delta Controls, Orca Vies, Setpoint Systems Corporation on October 23, 2013 by setpointsystems. The filter box at the top of the Navigator window can be used to quickly narrow down the list of displayed points to exactly what you’re looking for. For example, typing bi ai>50 in the filter box will display all Binary Inputs and any Analog Inputs which have a value greater than 50. Whatever filter you type here will remain in place as you move between controllers. To clear the filter, highlight it, then press “delete” and “enter” on your keyboard. This entry was posted in ORCAview Tips and tagged BAS, building automation control, Building Automation Systems, Delta Controls, orac view, Setpoint Systems Corporation on October 23, 2013 by setpointsystems.